Listeners need no detailed introduction to Aaron Copland as a composer, and require little in the way of analysis of his ballet suites. A few comments and observations may be of interest. 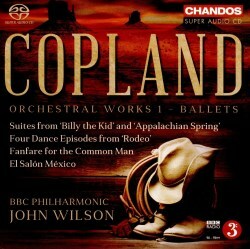 This appears to be the first of a series of CDs from Chandos devoted to Copland’s ‘Orchestral Works’. Yet, past experience does not fill me with confidence that this promise will be fulfilled. Instances where Chandos appear to have ‘given up’ include the orchestral music of Richard Rodney Bennett with only Volume 1 (CHAN10389) issued (2006) and two volumes (2006-2007 Volume 1 ~ Volume 2) of a similar project of works by Malcolm Williamson. I am still hoping for further issues in these series although I am not holding my breath. To be fair, the series of music by Janacek and Atterberg are progressing well. Aaron Copland composed a wide range of orchestral music – from his three symphonies, several concertos for organ, piano and clarinet to film music as well as ballets. New Grove lists six ballet scores: Grogh (1922-5), Hear Ye! Hear Ye! (1934), Billy the Kid (1938), Rodeo (1942), Appalachian Spring (1943-4) and Dance Panels (1959). A number of these stage works have been revised over the years: three have been issued as orchestral suites. Not a few have had piano reductions made. Although arranged for just about every possible combination of instruments, I do not believe (I stand to be corrected) that the Fanfare for the Common Man (1942) has been presented formally as a ‘ballet’. People may have danced to it in one of its ‘pop’ incarnations. Out of curiosity, this work is the only ‘surviving’ number from Eighteen Fanfares commissioned by Eugene Goossens during the Second World War. You can hear the others by Hanson, Harris, Cowell, Wagenaar, Gould, Taylor, Fuleihan, Thomson, Piston, Creston and Goossens himself on Koch International 3-7012 (deleted). The original Appalachian Spring was premiered by Martha Graham and her company at the Coolidge Auditorium in The Library of Congress, New York on 30 October 1944. It was scored for 13 instruments. Soon after this performance, Copland began his orchestral suite. He wrote that this arrangement is ‘a condensed version of the ballet, retaining all essential features, but omitting those sections in which the interest is primarily choreographic.’ The ‘Suite’ is some 8 minutes shorter than the original ballet score. To all intents and purposes, the orchestral suite has become the norm. For listeners to Classic FM the content of this great work is reduced further: usually only the ‘Simple Gifts’ section is played which are variations on the popular ‘Shaker Tune.’ I enjoy both the chamber and full orchestra versions of this work that epitomises ‘the countryside of New England’ and exudes a strong sense of American ‘national feeling’. The present recording ticks all the boxes. Billy the Kid was composed during the summer of 1938 for Lincoln Kirstein’s American Ballet Caravan. The book of the ballet is about Henry McCarty “William H. Bonney” (1859-81) who was a young ‘desperado’ better known as Billy the Kid. During 1940, the present Suite in eight movements was produced from the ballet score and is about two-thirds the length of the original. It is important to realise that this work is less concerned with biographical narrative than an evocation of an era and the landscape. Once again, Copland has provided a score that musically paints the ‘great outdoors’. Despite worries that he was ‘not a cowboy composer’ he has created the ‘definitive’ musical portrait of the ‘old West’. I guess that it has influenced countless Western movie film scores. Although El Salón México is infused with ‘dance music’ I do not understand it to be a ‘ballet’. The work was first heard in Mexico City on 27 August 1937, played by the Mexican Symphony Orchestra under Carlos Chávez. Copland had the first ideas for this work when he returned to the United States from a visit to Mexico in 1932. He made considerable use of Mexican tunes in this work, derived from a variety of ‘erudite’ volumes of local songs. It is no secret that this is a ‘picture postcard impression of the country rather than a profound examination of history, politics or social conditions.’ Yet again, it is a work that seems to epitomise a Hollywood concept of a Mexican bar. I know that traditionally there are only ‘Four Dance Episodes’ extracted from the ballet Rodeo (1942): Buckaroo Holiday, Corral Nocturne, Saturday Night Waltz and the famous Hoe-Down. However the missing third movement is rather fun, complete with honky-tonk piano. Fortunately, this was featured by Naxos in that label's excellent recording of the full ballet (8.559758). I would rather Chandos had dumped the ubiquitous ‘Fanfare’ to include this relative novelty. The CD is well-presented. The liner notes (English, German, French) by Mervyn Cooke are most helpful. The Salford-based BBC Philharmonic with John Wilson have captured the magic of this ‘all-American’ music. This is well communicated by Chandos's excellent sound. I await - with a little bit of trepidation - many further volumes of Copland's ‘Orchestral Works’. I certainly hope that the other ballet scores receive a performance as part of this series. I especially look forward to hearing the European/Boulanger inspired Grogh, which I rate highly, in spite of it being ‘untypical’ of the composer’s received output. Then there is the vibrant Hear Ye! Hear! that parodies Mendelssohn, jazz and dance music.